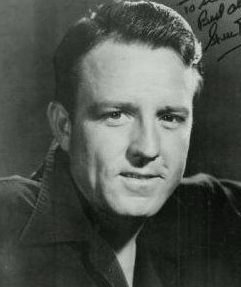 Steve Brodie was a contract player at RKO in the mid- to late-1940s, appearing in hits like OUT OF THE PAST and CROSSFIRE. Occasionally, he was featured in westerns, but he was more known for his work in film noir and television crime dramas. He mostly took supporting parts, but in 1947, he played the lead in DESPERATE which was directed by Anthony Mann. As he aged, the actor easily transitioned to character roles, especially on TV-- racking up over 150 screen credits by the end of his career. Both his wife and son also worked in the motion picture business. In 1975, Kevin Brodie acted alongside his dad Steve in the low-budget science fiction horror flick THE GIANT SPIDER INVASION. Steve had the starring role. Steve Brodie present and accounted for..! Carla Balenda was one of the many RKO's starlets 'discovered' by Howard Hughes in the late 1940s/early 1950s. She was put into action programmers like SEALED CARGO with Dana Andrews & Claude Rains, as well as HUNT THE MAN DOWN opposite Gig Young. But the actress wasn't entirely new to motion pictures-- she had previously been employed at Columbia a few years earlier, where she was billed under her actual name, the cute-sounding 'Sally Bliss.' Between 1944 and 1954, she appeared in just a dozen films; by the time Hughes lost interest in promoting her and in RKO itself, she had begun to transition to television. 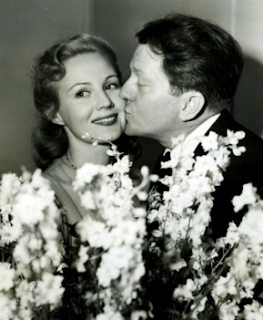 In the mid-1950s she was Mickey Rooney's love interest on his short-lived self-titled series. 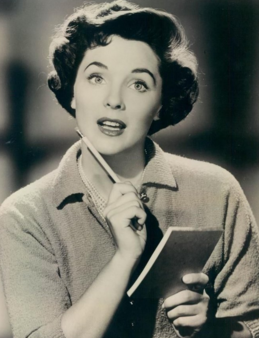 In 1957, she reverted back to using her real name, and as Sally Bliss again, she would begin a five-year recurring role on Lassie as Timmy's teacher. Carla Balenda present and accounted for..! Richard Attenborough had a very successful career in motion pictures. His breakthrough came in 1947 after several years of stage work and small roles on screen. 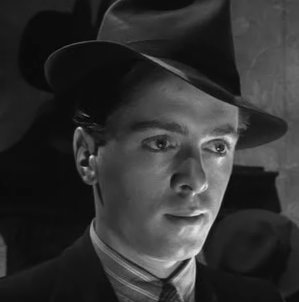 This is when he was cast in the film adaptation of BRIGHTON ROCK, where he played a psychopathic teen gangster. By 1949, he was one of Britain's most popular movie stars and appeared in a series of hits over the course of the next several decades. The 50s had him starring in comedies by the Boulting brothers, but he occasionally took roles in more serious projects. In the early 60s, he had formed a company with Bryan Forbes, where Forbes wrote and directed, while Attenborough produced and starred in films they made. There were crossover hits for the star later in the 60s, when he began to work in Hollywood productions. But Attenborough soon began to limit his acting appearances to focus on directing. This proved to be a smart decision-- by the early 80s, he had earned Oscars for directing and producing his most-known work, GANDHI. 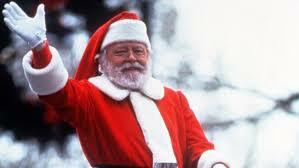 As if all this was not enough, Richard Attenborough reinvented himself in the 90s as a character actor in the Jurassic Park movies, and he also found time to play Kris Kringle in the remake of A MIRACLE ON 34TH STREET. Richard Attenborough present and accounted for..! When Bette Davis signed on to play Margo Channing in Joseph Mankiewicz's show biz drama ALL ABOUT EVE, she had no idea her new leading man would become her next husband. The man was 20th Century Fox contract player Gary Merrill who played Bill Sampson. During the course of production, the two fell in love and after a whirlwind courtship, were ready to marry. When Davis' divorce from her previous husband was finalized in the summer of 1950, she was finally free to wed Merrill. They quickly made a family, with Bette's daughter from the earlier marriage plus two other children the couple adopted. In 1951, they traveled to England to make the crime drama ANOTHER MAN'S POISON which did not fare well with critics and audiences. But back in America, they did score another hit with Fox's PHONE CALL FROM A STRANGER. In the film, Merrill is a guy who survives a terrible plane crash and goes to visit the families of several passengers he had bonded with during the flight. Bette plays the disabled wife of a larger-than-life passenger (Keenan Wynn), and she gives one of her more subtle, nuanced screen performances. 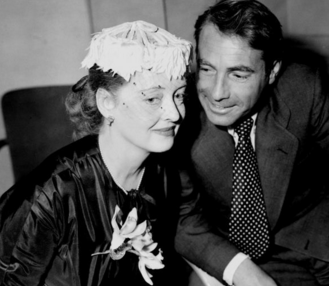 For a time, Gary Merrill brought out the best in her. 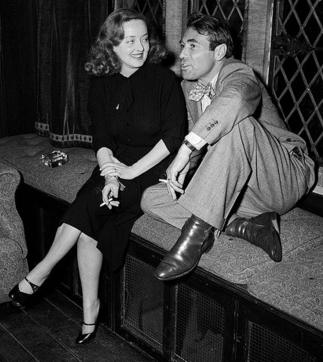 Bette Davis & Gary Merrill present and accounted for..! Saturday January 9th: A British actress and American actor who made two films at Paramount and married. Sunday January 10th: Rival radio personalities who appeared on screen together in the 40s. Monday January 11th: This month's series kicks off with an actress from OUT OF THE PAST. Tuesday January 12th: Warners Brothers gal could have been a big star if she hadn't quit the movies. Wednesday January 13th: Ma Joad. Thursday January 14th: A juvenile actress at Fox who started as Shirley Temple's nemesis. Friday January 15th: These two RKO stars and off-screen pals turned up in Macao. Madeleine Carroll had already achieved notable successes in her native England, when she was brought to Hollywood in the mid-30s to star in movies at Paramount. 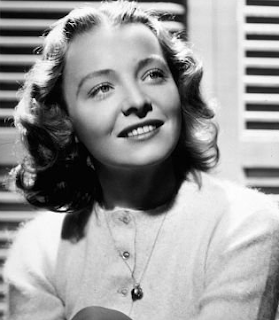 At first, she was cast in mystery dramas intended to capitalize on her earlier British hits with director Alfred Hitchcock in the same genre. But soon Paramount put her in romantic comedies (usually with Fred MacMurray) as well as action adventure yarns. In 1941, costarring again with MacMurray, she was assigned to do a film called VIRGINIA-- a drama that featured a brand new studio player in his first screen role. The guy's name was Sterling Hayden, and he immediately connected with audiences, as well as with the leading actress. The chemistry Carroll and Hayden shared was so evident to Paramount bosses that the two were quickly put in another film together. 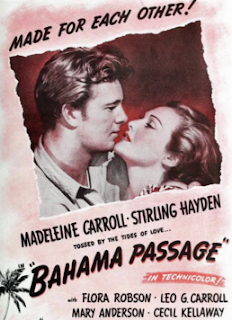 That time it was BAHAMA PASSAGE, a Technicolor tale shot in the Caribbean islands which reached theaters the same week Pearl Harbor was attacked. 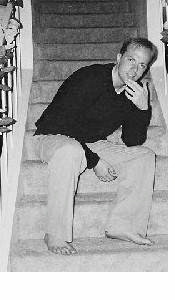 The couple were wed soon afterward and Hayden went off to military duty, like so many other leading men were doing at the time. 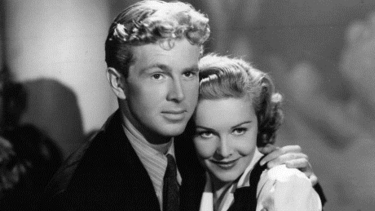 Stirling (Sterling) Hayden & Madeleine Carroll present and accounted for..! 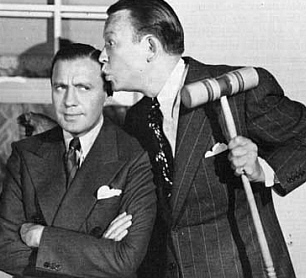 Jack Benny and Fred Allen were rival radio personalities, and in a friendly sort of way they had a 'feud' over the airwaves for many years. Audiences loved them, and both were at their peak in the 1930s and 1940s when radio was king. Of course, Benny would take his show to the small screen and do rather well with it, but Allen's attempts to transition to the new medium were not successful and he wound up hosting quiz shows until his death in 1956. For a time, when their careers were hot, they turned up occasionally in motion pictures. Benny made more films than Allen did, but they both experienced big screen hits. One of these paired the two men, continuing their adversarial yet highly comical relationship in the appropriately titled LOVE THY NEIGHBOR in 1940. It was followed up with a mid-40s version of 'The Twelve Chairs' called IT'S IN THE BAG. 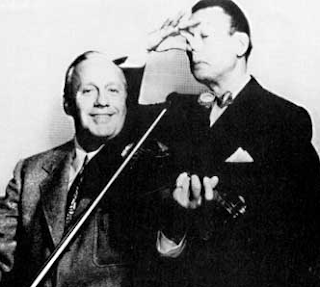 Jack Benny & Fred Allen present and accounted for..! 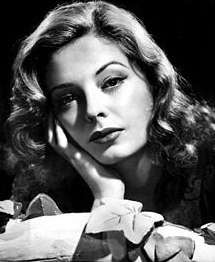 Jane Greer made her mark in films during the late 1940s and early 1950s at RKO, usually cast in film noir. 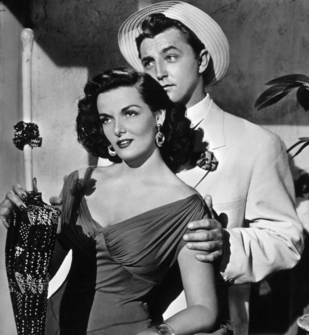 She is probably most identified with her role as a femme fatale in OUT OF THE PAST, opposite Robert Mitchum. Until that time, she had been working in light musical-type programmers and studio B films. Her success in crime dramas, however, ensured more roles in the genre, such as THEY DON'T BELIEVE ME with Robert Young and THE BIG STEAL, again with Mitchum. In the early 50s, she moved over to MGM but most of those assignments were not as compelling and her screen career went into decline. There were occasional movie parts in the following decades, as well as guest starring gigs on television. She also focused her energies on raising three sons, one of whom followed in her movie footsteps and became a successful producer. Jane Greer present and accounted for..! TopBilled, wasn't there something about her having a condition which partly paralyzed her face, giving her that totally deadpan look? Whatever it was, it worked well for her having a very flat type expression particularly when she was giving Mitchum the business in OOTP. It was great seeing her appear in David Lynch's tv series, "Twin Peaks" also. I don't know about a medical condition. But she's certainly one of my favourite actresses in noir. The flat cold zen expression is usually devoid of emotion, which is what those characters needed. When Lizabeth Scott played bad, she was still injecting cute with the cunning. While Ann Savage and Jean Gillie were just over-the-top vicious in their pictures. But Jane Greer is much more aloof and mysterious and doesn't betray the feelings that motivate her, which makes her far more interesting in this type of portrayal. Who didn't Jane Bryan act alongside during her short four-year movie career at Warners? They put her with most of the studio's top-names-- George Raft & William Holden in INVISIBLE STRIPES; Bette Davis & Humphrey Bogart in MARKED WOMAN; James Cagney and Raft again in EACH DAWN I DIE; Miriam Hopkins & Davis again in THE OLD MAID; and well, you get the idea. It was obvious that she was on the fast-track to big-time stardom. But in late 1939, Jane Bryan married a Boston-based entrepreneur and walked away from Hollywood. 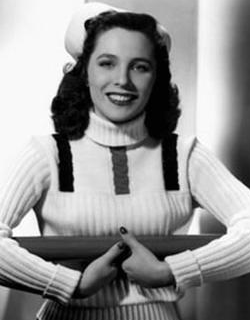 Her last picture was released in early 1940, and it costarred Ronald Reagan. Forty years later, she and her husband helped support Reagan's presidential campaign. 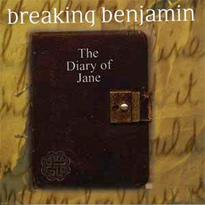 And near the end of her life, in 2006, she was the subject of a hit song 'The Diary of Jane,' by the rock band Breaking Benjamin. In fact, a shot of her tombstone is used in the accompanying music video. And the band's album WE ARE NOT ALONE, is named for one of the films the actress made with Paul Muni. How's that for immortality! Jane Bryan present and accounted for..! 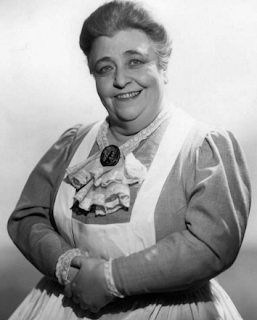 When she made her last screen appearance in 1964's MARY POPPINS, Jane Darwell had been in motion pictures for about fifty years. She started in the silent film era and had some early successes but soon returned to the theater. When sound came in, she was back in Hollywood, and soon the character actress found herself in demand playing character roles. Not every part was worthy of her talents, but she worked consistently across a variety of genres during the golden age of the movies, giving nothing less than her customary excellence. But the roles she did for director John Ford are the ones that gained her lasting fame. 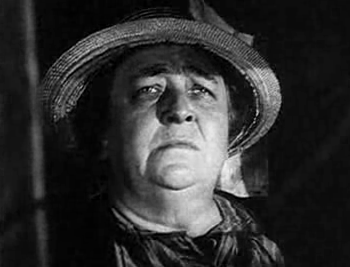 While some of the later assignments were not as important as her Oscar-awarded turn as Ma Joad in the adaptation of THE GRAPES OF WRATH, she still figured prominently in each film she did for Ford. She made six feature films for the director, and overall, she had over 200 screen appearances. In addition to the movies, she continued to find time for the stage, plus she worked on radio and television programs. Jane Darwell present and accounted for..! When Jane Withers played Shirley Temple's nemesis in 1934's BRIGHT EYES, she made such an impression on audiences that the bosses at 20th Century Fox put her in a series of her own movies. Of course, the obnoxious personality traits were toned down, and what emerged was a sweeter, kinder Jane that in many ways experienced the same kinds of growing pains Shirley did in her bigger-budgeted productions. Despite the B-film classification of the Withers vehicles, they were a hit with the public and the studio made almost 30 of them between 1935 to 1942. During the war years, the more mature actress moved over to Republic where she made grown-up romantic comedies. 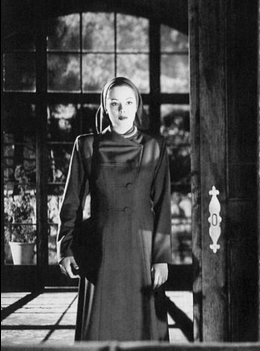 She also turned up in occasional dramatic roles, such as Lewis Milestone's THE NORTH STAR. By the late 40s, her feature film career had waned, and she began to turn to television. There were a few key supporting roles in later years, such as the one she played in GIANT. Before long, however, the former child star had transitioned mostly to television. She gained added fame in a series of commercials for a sink cleanser in the 60s and 70s. 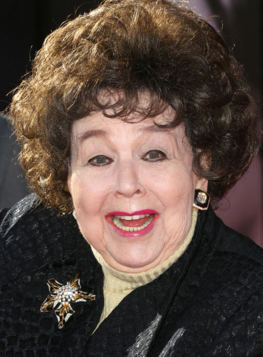 And in her later years, there was a resurgence of interest in her early screen work, especially when the Shirley Temple picture that put her on the Hollywood map re-aired on a classic movie channel. 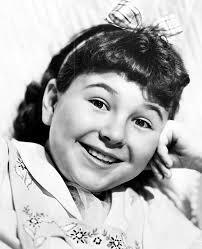 Jane Withers present and accounted for..! Jane Russell had a few memorable pairings during her illustrious screen career. She made two films with Bob Hope, two films with Richard Egan, and two films with Robert Mitchum. But of all these paiirings, the one with Mitchum was perhaps the most electric. 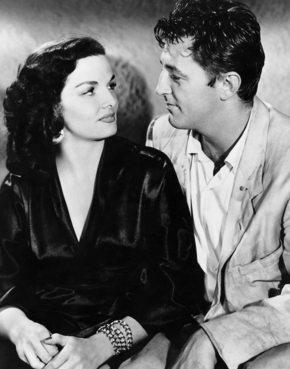 The stars were under contract at RKO during the Howard Hughes era, and in the early 1950s, Hughes assigned them to a film noir called HIS KIND OF WOMAN. Supporting players included Vincent Price and Tim Holt, but the audience was busy watching the leads. Hoping to duplicate the success of the picture, the studio cast the duo in another noir, MACAO, a short time later. And while they did not make any other movies together, the two stars remained life-long friends. Jane Russell & Robert Mitchum present and accounted for..! 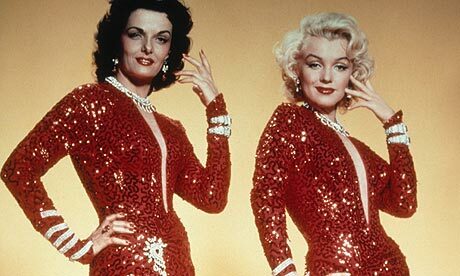 My favorite Jane Russell "pairing," is with Marilyn Monroe in "Gentleman Prefer Blondes." Such a great movie and Jane played the perfect friend for Loralie Lee, we wouldn't have liked her quite as much if we hadn't seen her through Jane's eyes as a loyal, kind hearted friend as well as a man-magnet. AD,don't you love the clothes and the jewels that Lorelei and friend wear throughout this film? Saturday January 16th: A leading lady at Warners and her husband, who costarred with her. Sunday January 17th: Warners' answer to Crosby & Hope. Monday January 18th: Memorable character actress and occasional lead of the 30s and 40s. Tuesday January 19th: Lucas McCain. Wednesday January 20th: Italian actress who was awarded an Oscar. Thursday January 21st: A crowd-pleasing second banana who was once Top Banana. Friday January 22nd: Radio stars who appeared in musical films at RKO in the 40s. Virginia Mayo had a supporting role in the biographical drama JACK LONDON in 1943. In fact, it was one of her first significant parts in a motion picture. It was also significant, because during production she met the lead, Michael O'Shea, and the two fell in love. They were soon married, and it was a union that produced a child and lasted 26 years, until O'Shea's death in 1973. While O'Shea did a series of contracted roles at home studio 20th Century Fox over the next ten years, Mayo signed with Sam Goldwyn. She was in several films with Goldwyn's big star Danny Kaye, before her services were sold to Warner Brothers later in the decade. At Warners, the actress received a big build-up and she costarred opposite James Cagney, Ronald Reagan and Gregory Peck in notable films across a variety of genres. Still, Mayo found time to appear in productions with her husband-- in between movies, they did several plays together including 'George Washington Slept Here' and 'Fiorello!' which gave them a chance to show audiences up-close how much they enjoyed each other's company. Virginia Mayo & Michael O'Shea present and accounted for..! TopBilled, I love Virginia Mayo. I always wanted to put her in a movie with Joan Caulfield as her sister, but will admit Virginia had more vim and vigor! It does occasionally bother me in a straight on shot, that her eyes seem a bit crossed but I can work around that and just enjoy her fine performances. 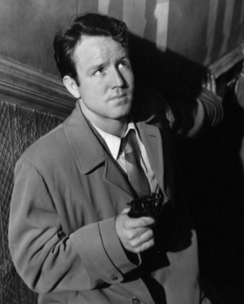 Michael O'Shea is, in my estimation, one of the more overlooked actors of the late 40s/early 50s in film. He's especially good in hard-hitting crime stories, but also a lot of fun opposite Sonja Henie in IT'S A PLEASURE and with Thelma Ritter in THE MODEL AND THE MARRIAGE BROKER. 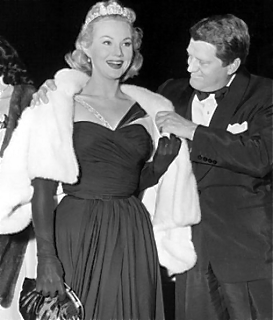 He should have been a bigger star, but I have a feeling he was content being Mr. Virginia Mayo-- he truly doted on her. Jack Carson and Dennis Morgan were life-long buddies who had originally met in the 1930s and worked together in the midwest. They did not arrive in Hollywood at the same time, but by the early 1940s, both were making movies and both were under contract at Warner Brothers. When rival studio Paramount found success pairing Bob Hope and Bing Crosby, Warners decided to try and duplicate the formula by putting Morgan and Carson into their own road movies. The formula presented the two stars singing and joking their way across America, first in TWO GUYS FROM MILWAUKEE (paying homage to Morgan & Carson's Wisconsin roots), then in TWO GUYS FROM TEXAS which cast them opposite Dorothy Malone (who had grown up in Texas). There were other musical comedies, too, like THE TIME, THE PLACE AND THE GIRL and IT'S A GREAT FEELING. The scripts may not have been the best, but the basic scenarios allowed the two buddies to entertain audiences with their charm and well-honed brand of shtick. Dennis Morgan & Jack Carson present and accounted for..! 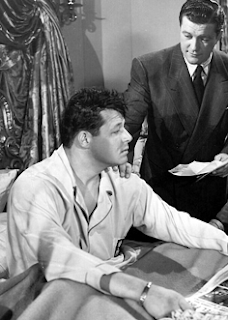 Jack Carson is so good in "Mildred Pierce," he inhabits that character as though he were playing himself. Love him. Yeah, personally I prefer him in dramas. I love his performance as a doomed husband in THE HARD WAY, and as Paul Newman's older brother in CAT ON A HOT TIN ROOF. 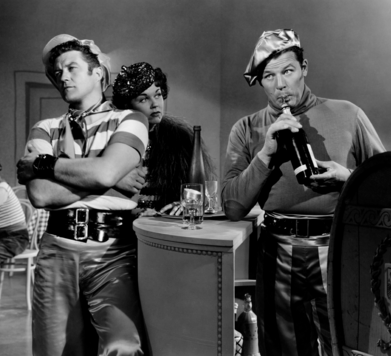 Versatile actor, that Jack Carson.